Funeral services for Sammie Jo Amacker Amacker, 27, of Rayville, LA will be held at 1:00 PM, Friday, February 8, 2019 at Brown-Holley Funeral Chapel, Rayville with Chaplin Richard Quintana and Debbie Corley officiating. Interment will follow in the Northeast Louisiana Veterans Cemetery, Rayville, LA. Sammie was born September 17, 1991 in Vicksburg, MS and passed away Tuesday, February 5, 2019 in Monroe, LA. Sammie loved her military service, all it encompasses, duty, honor, and country. She followed her father’s footsteps into the Armed Services, serving with U.S. Air Force. 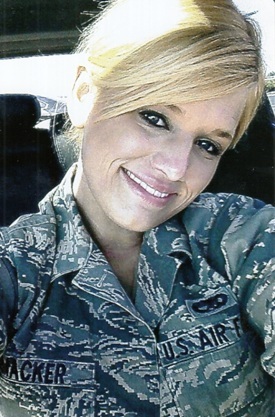 She loved God, her parents, and the Air Force. Sammie is preceded in death by her father, Joe Amacker; grandparents, Norman and Gladys Amacker and Fred and Cecilia Radau. Survivors include her mother, Fredia Amacker of Rayville; sister, Brandy Radau Benton of Monroe; nephew, Jace Benton of Monroe; host of aunts, uncles, and cousins; Godparents, Debbie and Clyde Corley of Epps; and a special loved one, Larry Copes of Delhi. Visitation is 5:00 PM – 8:00 PM, Thursday at Brown-Holley Funeral Home, Rayville.